Working on problem-solving presentation? 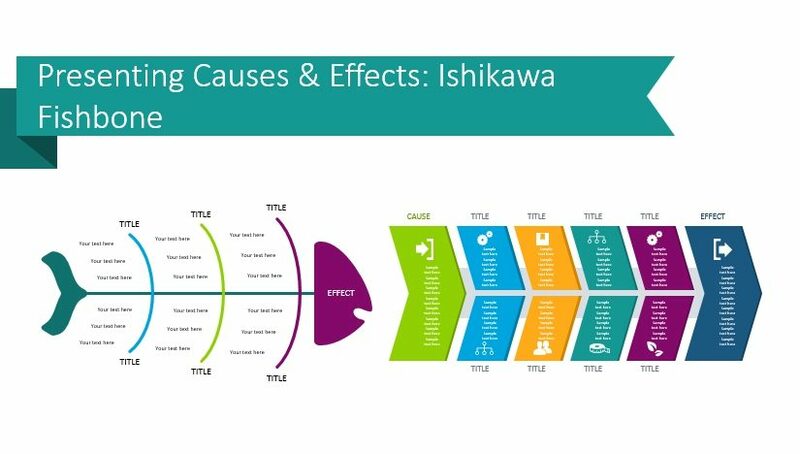 In this blog, we are presenting 5 examples how you can use the cause and effect diagram to analyze a business challenge or problems of various kinds. 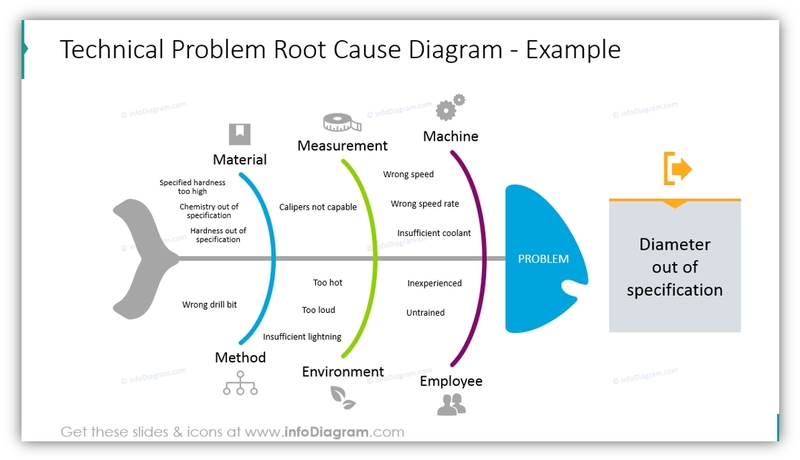 See how you can easily show to your audience the discussed problem broken into cause and roots. Furthermore, this tool can be used as a brainstorming technique for problem-solving in order to find the underlying roots of observed problems. 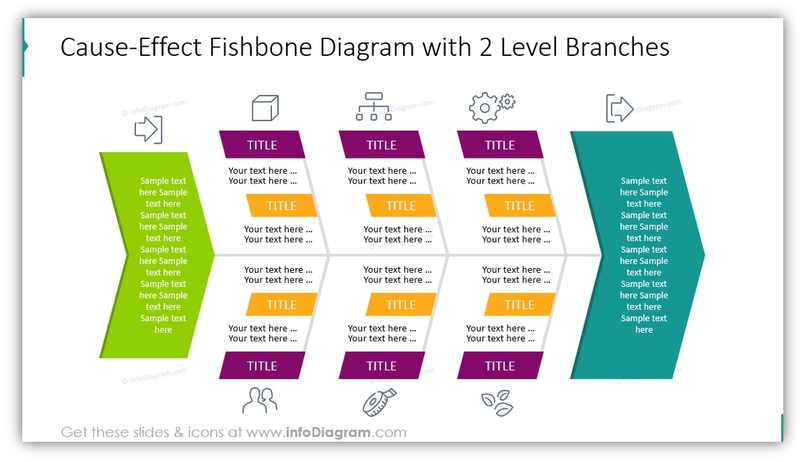 Check five ideas of how you can visualize the fishbone chart in order to use it for any purpose we listed above. Note: All presented slides can be found in Cause & Effect Fishbone PowerPoint Diagrams. 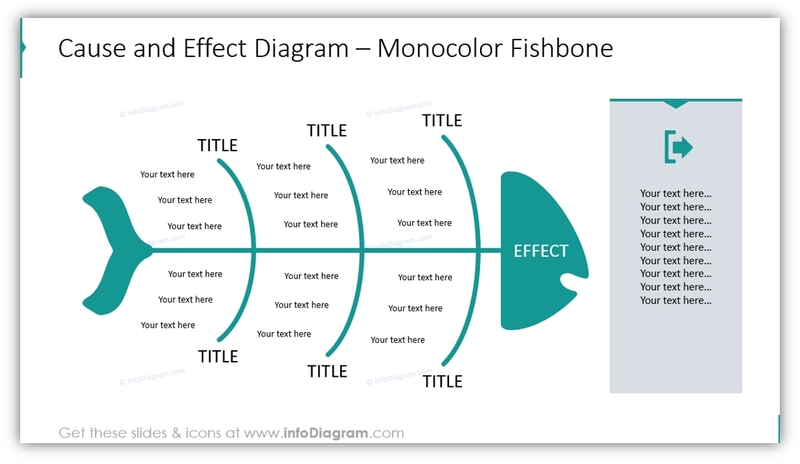 See how this Fishbone diagram can be visualized, applying modern flat infographics style along with flat icon set. You can see the full collection by clicking on any picture. If you prefer more decent look, consider mono-color diagrams. This will work for you also if you have rigid corporate restrictions, you can use one color for the whole diagram (the turquoise outline can be modified to any other color that will fit your branding). When you are visualizing product development or design process, cause and effect diagram can serve as a good tool. All shapes are placed in such a way that a white arrow is clearly visible, so for the listener, it will be easier to perceive the information, despite a lot of data on a slide. We put title for each bone and two icons in the beginning and end of the chart. Notice the shape of fishbone inside? Look at white gaps :). 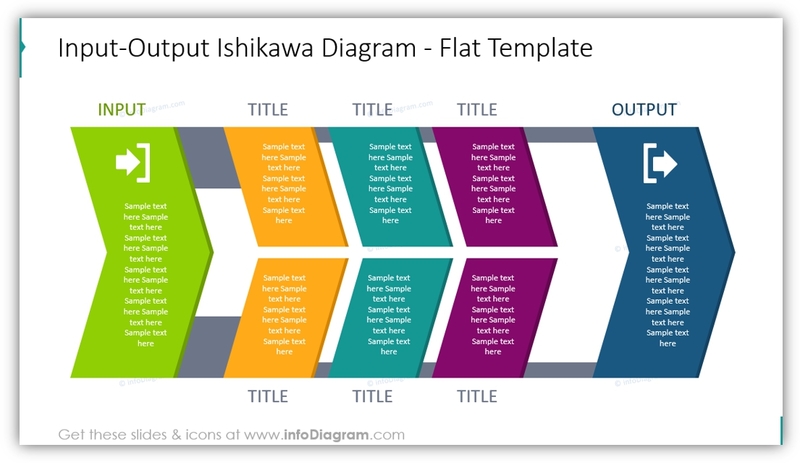 You can visually show the causes and a result of a process using the Ishikawa diagram. We placed symbols near each root and applied different colors on three parts of the chart. If you need to put several concepts on one bone, a good idea is to create two levels: six roots are definitely better than 12. A quick advice: choose the keywords to eliminate the amount of text and focus attention on the most important points. 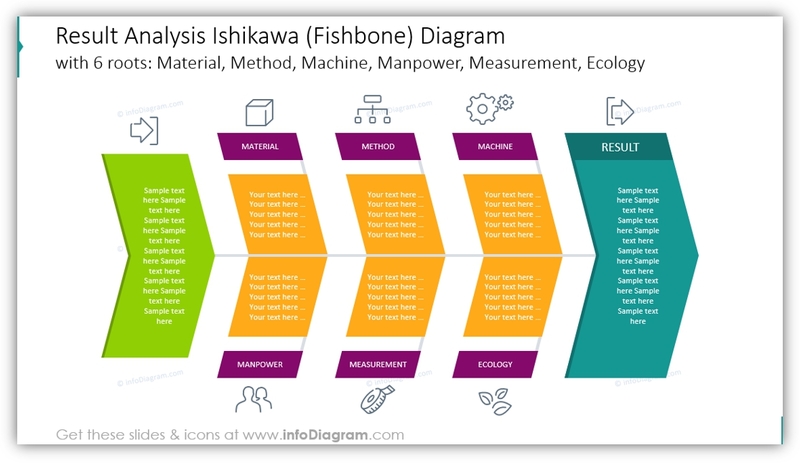 Why Fishbone Diagram to Present Effects & Causes? We hope our blog was inspirational for you 🙂 You can use the ideas and try to recreate such diagrams from the examples above or download get ready-to-use PPT slides. If you like the slides above, you can get the fishbone collection here (or subscribe and get slides every month for your needs). Should you need a help with choosing or using the PowerPoint graphics, let us know here. We will gladly assist you.